Growing up, one of my favorite things was having "breakfast for dinner." Most of the time this meant my Mom pulling a tray table up to the dining room table, setting up the electric griddle and cooking French Toast. She would whip together eggs and milk, dip white bread in the mixture, cook it up on the griddle and serve topped with butter, syrup and cinnamon & sugar. She used to keep this little yellow tupperware container of the prepared cinnamon & sugar mixture in the cabinet. It had a little flip top so that you could pour it right onto the French Toast. Thinking about it now, I realized that this is more like dessert for dinner! She'd cook away until the kids were done and then she'd finally make some for herself. My Dad rarely partook in this tradition, he said it was too sweet for him. He'd make a sandwich or have a bowl of cereal instead. Since going gluten free I have only tried to recreate this recipe once. I can't remember which bread I used but it was a total failure. Last weekend it suddenly dawned on me that Udi's would be the perfect bread to try this again, and I was right on. It was still very different than the original but as that photo above shows, it looked exactly the same. It tasted awesome too despite the fact that the bread is gluten free, the milk is almond milk, the syrup is pure maple (instead of "table syrup" aka high fructose corn syrup) the butter is Earth Balance, and I didn't put cinnamon & sugar on it this time. This is best served on a rainy Sunday morning in front of the tv with a glass of OJ. Enjoy! This post is part of what I hope will be a series of posts involving a new recipe every week. I have started a new blog called Jen's Life to the Fullest which is basically my Bucket List. It is a list of things I want to do at some point in my life. Some are lofty, some very basic but I always have a ton of ideas and I have a habit of forgetting or getting lazy. This is a way for me to stay focused. I hope you'll check it out! Looks yummy, though I imagine the bread would make it or break it. 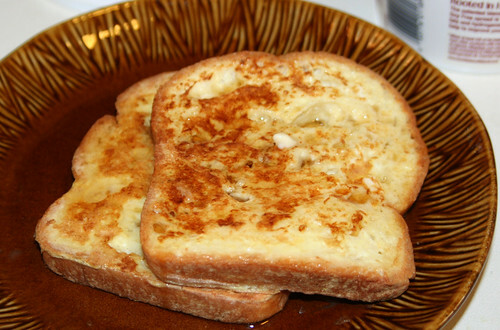 Have you tried making French Toast with Frozen Gluten Free Bread, I have and it doesn't soak up the egg the right way. I started using home made bread. I have heard good things about Udi's how does their bread work? Udi's works great because it can be left out on the counter defrosted so when you use it for French Toast it's just like regular bread!! I have tried other kinds of gf bread and they just don't absorb the egg the same way nor do they get that golden brown crust. I imagine homemade fresh gf bread would work great as well! Hello Jen!! Your gf French toast looks so tasty & pretty too! Many greetings from a recent gf foodie from Brussels, Belgium!